New baby gifts to celebrate the birth and congratulate the parents. Welcome a new baby with a gift basket. Send unique baby gift baskets and affordable baby shower gifts to fit every budget! Find new baby gift ideas for baby girl, baby boy, triplets, twins and don't forget to send along a gift for the new mother. 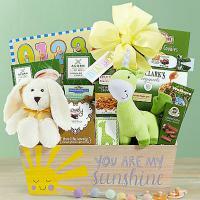 Buy memorable new baby gift baskets that are sure to make a lasting impression. Pampering gift set for newborn babies. When you know somebody who just had her baby, it is natural to think of getting the proud parents some baby gifts that they will truly cherish. Why not check out giving a creative idea for a baby gift like a new baby gift basket with a fun theme? 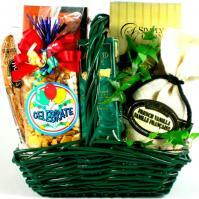 Of course, the well-crafted gift basket theme is a careful formula that has both the baby and the new mom in mind. To sum up, gift baskets are not only a fun way to wrap up several gifts but are also a fantastic way to give anyone lots of little goodies to go over instead of just one bulky package. Baby boy gift baskets and baby shower gift ideas for baby boys make the most unique gifts because they are both practical and unique gifts for boy babies. You can welcome that new baby boy into the world, and delight the new parents, with our adorable newborn baby boy gift baskets. Baby boy gift basket can include such themes as jungle animals, sports, baby books and toys to keep the new baby boy entertained. A happy baby leads to a happy mommy, and moms usually can't stop looking for ever new ideas how to help their baby to have fun by being active. Lots of plush and stuffed toys out there are perfect hitchhikers for that baby toys basket. Aside from animal figures, try putting on the basket a mobile and toys that will keep the adorable baby occupied. 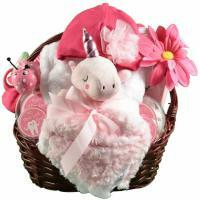 Baby girl gift baskets make the most adorable gifts for a newborn baby girl. 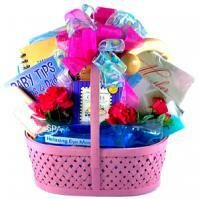 Buy the sweetest new baby girl gift baskets at Adorable Gift Baskets. Find baby shower gift basket ideas for a baby girl, gift baskets to welcome a new baby girl and other adorable baby girl items for girl babies. Shop our affordable, inexpensive, discount baby girl gift baskets, gifts and baby girl necessities on sale. Gifts for baby girls are delivered to the proud parents free of shipping charges. Getting the child to develop a love of books and reading at an early age is one big needed boost in his or her education. In fact, children that develop the natural love for reading gain more confidence when it comes to school and learning. "Readers are leaders." Aptly named, board books are a hardy bunch that can withstand countless tossing or chewing or anything that a baby does to anything it lays its hands on. Pampering gift baskets and gift ideas for new mothers, mothers to be, expectant and pregnant women expecting a new baby.